Like Cyril could, by looking sweet. But no one threw a treat for Pat. Poor Cyril! He's the only squirrel living at Lake Park, and he is lonely. Then, one day, a new 'squirrel' makes an appearance. Cyril is beyond excited to meet Pat and have a mate for playing games, planning and performing puppet shows, skateboarding and bothering pigeons by sneaking up and scaring them. He is oblivious to the fact that he and Pat are not quite the same ... he cannot see any difference between them. Pat is his friend. Every creature in the park tries to tell Cyril that he is making a big mistake. Pat is not what Cyril thinks he is. 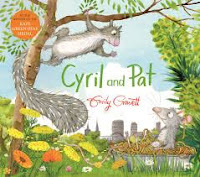 Cyril knows Pat to be a companion, a 'real joker', 'brilliant sharer', 'clever squirrel who can't be caught', and a 'rat'? All the others are quick to let Cyril know all that is wrong with a squirrel being a friend with a rat. "SQUIRRELS CAN'T BE FRIENDS WITH RATS!" With Pat out of the picture, Cyril returns to a state of melancholy as all park life seems to go wrong. When he is finally chased from the park by the dog Slim, and into the city at night, Cyril is terrified. It's dark, and strange, and he is all alone to protect himself from those terrifying canine teeth. Or is he? Friendship comes in all shapes and sizes. Emily Gravett has her fans in her heart when she shares her charming stories that resonate with young readers. Be sure to add this one to your list of perfect books for reading aloud. If you do, you will not only enjoy the timely tale, but you will be privy to her artistic talents so wonderfully displayed on every double page spread. From the warmth and bustle of the park and its sometimes scary moments to the real terror of an unknown urban landscape, she manages to entertain and draw our attention to the many fine details in the full-of-action, witty scenes.